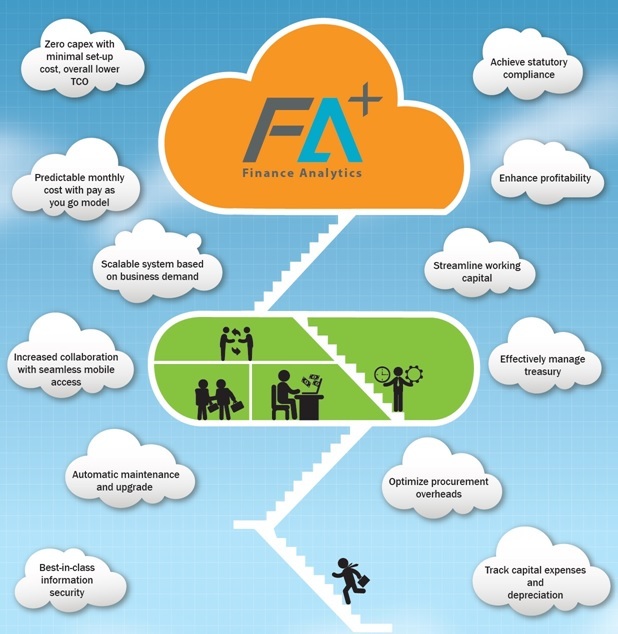 Finance Analytics (FA+) Solution is now available on the cloud! With mission-critical apps and sensitive corporate data increasingly moving online cloud based Business Intelligence solutions are gaining prominence. InformationWeek 2015 Analytics, BI & Information Management Survey findings show that cloud-based data warehousing services adoption jumped to 34% in 2015 from 24% in 2014. Other recent reports confirm that the top three financial drivers behind the move to cloud-based analytics and BI platforms are minimized hardware and infrastructure cost, reduced implementation cost, and reduced administrative cost, in that order. With this milieu of customers increasingly opting for Cloud BI, GrayMatter is now offering its pre-built, enterprise-wide finance analytics (FA+) solution on Microsoft Azure Cloud! The FA+ solution, of course, enhances profitability, promotes better cost tracking and control, optimizes working capital flows, effective management of treasury while ensuring statutory compliance. As the image above depicts, FA+ on cloud ensures a significantly higher ROI with staggered investments, coupled with zero maintenance overheads. And all this with the proposition of a superior user experience with enhanced collaboration and assurance on information security guaranteed!